With over 400 games available, Titan Casino makes the perfect gambling site for those who enjoy playing some online slots while also taking their wagers to the tables. 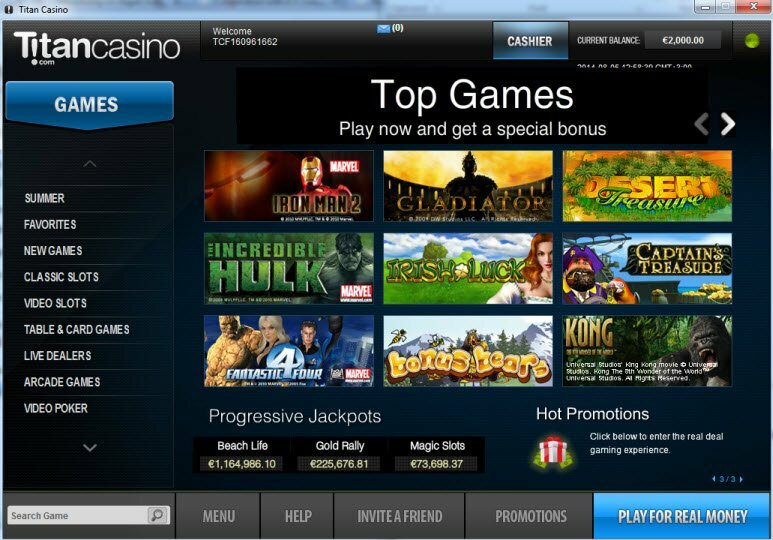 Players can access the Instant Play or download Titan Casino on their computer. What’s the added bonus? The mobile casino version allows gamblers place bets from anywhere. Titan Casino software comes from Playtech, one of the leading brands in the online casino industry. While, I personally prefer other software providers, when it comes to Playtech casinos, you can expect a high quantity of games at relatively high quality. Titan Casino Games offer over 400 options such as Classic Slots, Video Slots, Blackjack, Baccarat, Roulette, Poker, Live Dealer, Video Poker, Progressive Jackpots, Multiplayer Games, and Scratch Cards. Games available at Titan Casino also include the popular Marvel Slot Jackpots like Iron Man, Fantastic Four, The Avengers, and X-men Slots. Titan also features one of my favorite online slots, Halloween Fortune. Welcome Bonus definitely stands out as one of the best in the business, awarding players up to $5,000 for the first four deposits. First thing’s first – Let’s talk about the Titan Casino First Deposit Bonus. Everyone wants to know what they get for signing up at a new casino. The Titan Casino Welcome Bonus definitely stands out as one of the best in the business, awarding players up to $5,000 for the first four deposits. Throughout the month, Titan Casino promotions continue to award players with extra money and spins on their favorite games. For example, the Monthly Bonus gives players 100% up to $200 for six months. This site also offers plenty of weekly bonuses and promotions which change throughout the year. One thing remains the same, the Titan Casino bonuses have a lot to offer players, both new and old. After giving some demo games a try, the time finally arrives to place real money bets at the casino. We understand the hesitation you may have in providing your precious financial information to just any online casino. Don’t worry when it comes to Titan Casino online banking. Titan Casino offers safe and secure banking in a number of currencies including US dollars, Canadian dollars, South African rand, British pounds, euros, and krone. Make sure to look into the 15% cash bonus that Titan Casino awards for using certain payment methods such as Neteller, InstaDebit, Moneybookers, and PaySafeCard. 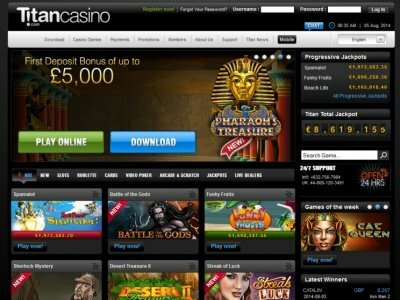 A top brand like Titan Casino has the capability to cater to their customers better than smaller gambling sites. Their Live Chat support runs smoothly, and quickly puts you in touch with a customer service agent after just a few minutes. 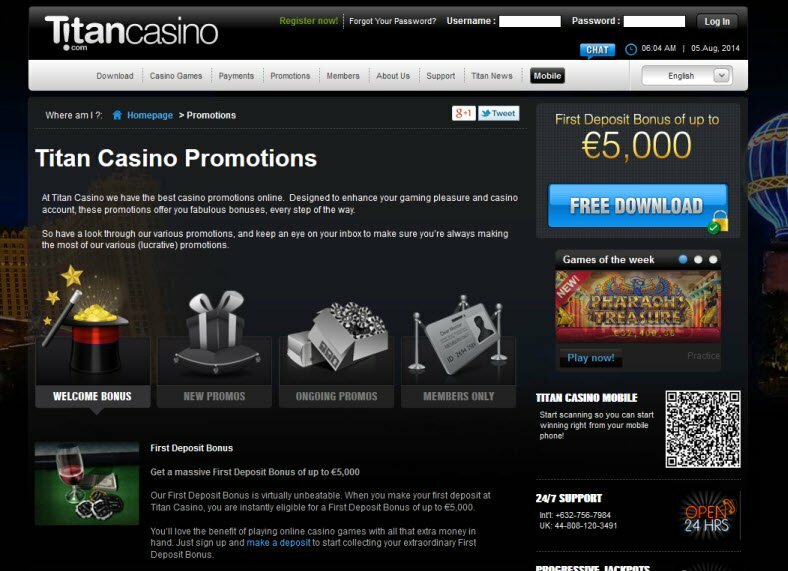 In addition, the site has quite an extensive database of information for customers to read about the casino and receive instructions for playing. Titan also provides customers with email support that directs you right to a specific department. Players can also call or fax the casino internationally or Toll-Free from within the UK.